In August, a rig was being assembled fairly close to shore. For now, the operational rigs are too far away to see from the beach. This one was moved, too, once work was completed. VIDEO: Can Ghana survive an oil spill? The new oil industry is changing life in Ghana and there are significant environmental concerns related to Ghana’s fast-track development of deep-water offshore drilling. This story was produced in cooperation with the Pulitzer Center on Crisis Reporting. On November 3, 2011, fishermen working near the Jubilee oil field 60 km. off the coast of Ghana spotted a large oil slick floating towards land. The next day a dark, syrupy ooze arrived onshore, coating beaches of several fishing communities and waterfront hotels in Ghana’s Ahanta West District, the coastal strip closest to the country’s new, deep water oil field. The fishermen told authorities they suspected the spill came from the offshore operations, but the incident was greeted with seeming indifference. No official clean-up was launched, so the community was left to clean up the mess itself. “The lack of any clear information about the incident has made many in the coastal communities nervous about the future,” said Kyei Kwadwo Yamoah of the Friends of the Nation, a Ghanaian community development organization. Even as the Jubilee field was in development, environmentalists warned it was moving too fast. To activists, official silence surrounding the November incident was evidence that Ghana lacked the ability to properly oversee offshore oil operations. Reports by non-governmental organizations show that the companies that developed the Jubilee field, and the World Bank Group officials who lent hundreds of millions of dollars to jumpstart the project, were aware of the risks from the beginning. What’s also clear is that everyone knew the Ghanaian government lacked adequate monitoring systems, regulators to police the industry and equipment needed to react to spills. Located along Africa’s Atlantic Coast, Ghana is slipping down the same unregulated slope as other countries that hug the Gulf of Guinea: Promises of economic development along with a lure of easy money have prompted governments to encourage the rapid growth of an industry in a regulatory vacuum. The oil industry, in effect, is left to monitor itself. Ghana’s Western Region boasts some of the country’s most striking coastline. Rocky coves and tidal pools give way to palm-fringed stretches of sandy beach where dolphins and sea birds dash in and out of crashing surf and where a lucky visitor might spot a nesting turtle. 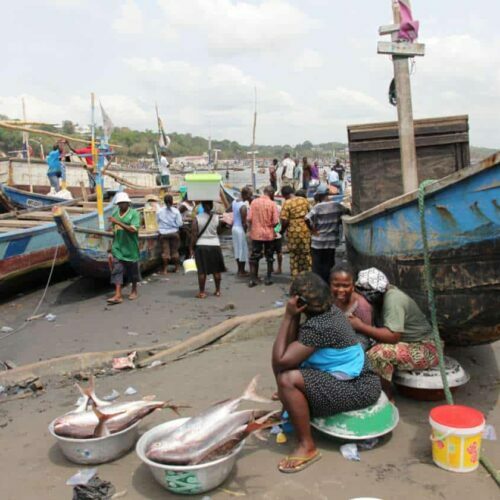 Historically, the coastal region’s economy has depended on fishing, which benefits 2 million people — 8 percent of Ghana’s population — but is predicted to unduly suffer from pollution generated by oil operations. Government and industry officials acknowledge that they have no compensation fund to support fishing communities in the event of a major spill — the type of response that kick-started recovery in U.S. Gulf Coast states after the 2010 Deepwater Horizon disaster. That reality leaves many coastal residents and environmental activists doubting the government’s promise that in Ghana, oil would be a blessing, not a curse. What they’ve seen instead is a fast embrace of the industry: local boosters quickly adopted the nickname “Oil City” for the coastal region’s capital, Sekondi-Takoradi. When U.K.-based Tullow Oil announced in June 2007 that it had discovered oil in commercial quantities, no one expected that crude would flow just three and a half years later. At the time, Tullow officials spoke of needing up to seven years to develop the field. But boosted by $215 million in loans from the International Finance Corporation (IFC) — the private financing arm of the World Bank — Tullow and its partners, the American companies Kosmos Energy and Anadarko Petroleum Corporation, were able to get the $3 billion Jubilee field ready in record time. Ghana became the latest West African country to share in an oil exploration boom that had taken on new emphasis after the September 11, 2001 terrorist attacks. Companies like ExxonMobil and Chevron-Texaco had been major players in Equatorial Guinea, Angola and Nigeria since the 1990s. After the terrorist attacks, the United States looked increasingly to Africa as a “safe” alternative to Middle Eastern oil. Then-President George W. Bush traveled twice to sub-Saharan Africa and met with a number of African heads of state. Exploration in the Gulf of Guinea was pushed by rising oil prices and advances in deep-water drilling technology. Nine years later the Deepwater Horizon oil disaster gave African offshore development an unexpected boost. “The moratorium on deep-water drilling in the Gulf of Mexico left a lot of drilling rigs with nothing to do and then the oil companies are faced with these half-a-million-dollar-a-day contracts with nothing to do,” said Stuart Wheaton, development director for Tullow Oil Ghana. Operators moved rigs from the Gulf of Mexico to oil fields around the world and some made it to West African waters. In those same waters, Ghana’s offshore development had gotten its head start from the IFC, whose loans served as a “green light” for other potential investors. Mary-Jean Moyo, the IFC’s country manager for Ghana, said the corporation’s financial backing in 2009 was crucial in attracting other private investors to the Jubilee project. In a review of environmental documentation prepared by the IFC, the environmental organization Pacific Environment also questioned IFC support for the project, citing: “Inadequate assessment of impacts on endangered species and critical habitats; inadequate assessment of noise impacts on marine mammals, dumping of drilling wastes into the sea,” and a failure to demonstrate compliance with international standards. Industry officials say the risks of the Jubilee development are manageable. “It’s fair to say the capacity and capability for national emergency response is low, but we’ll just have to keep working at it as the years go by,” said Tullow Oil’s Wheaton. “Everything has some sort of risk associated with it, so you try to minimize those risks and if we do have a spill, what we have done is we’ve brought equipment in,” he added. The company has clean-up equipment on-site and is a member of the industry-funded Oil Spill Response Ltd., an organization that says it can airlift equipment from the U.K. within 24 hours in the event of a major spill. Even though Jubilee field production has started, Ghana has yet to update environmental laws governing extractive industries that were written a generation ago. Ghanaian officials said new legislation will be considered this year. Ghanaian environmental officials also said they are prepared to act in case of a spill. Production from the Jubilee field hovers at around 80,000 barrels per day, but that’s expected to increase substantially over the next decade. 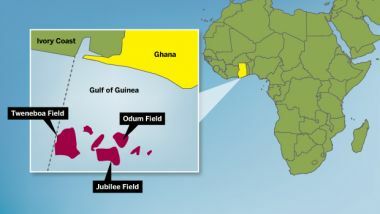 As proof of their technical expertise, Ghanaian government and oil company officials have touted the pace at which the Jubilee field was brought to production. Environmentalists point out that the country’s first deep-water oil project was its first major oil project of any kind. Amid the ramp-up to commercial production, the Deepwater Horizon spill occurred. The blowout of the Macondo well off the Louisiana coast on April 20, 2010 was an “eye-opener” according to one Ghanaian official, who said the blast prompted the government to review all of its safety procedures. The Deepwater Horizon disaster did not slow down Jubilee development, however, and the government review has yet to yield any new regulation. In October 2011, Offshore Magazine reported on a deep-water technology conference in New Orleans where Dennis McLaughlin, Senior Vice President with Kosmos Energy, gave a talk titled, “Reviewing Lessons learned from the Jubilee project.” In it he acknowledged that, “large deep-water projects are inherently difficult and risky,” and then described what it was like to develop the Jubilee field in a country with no regulatory or commercial infrastructure. During the Jubilee field development Kosmos Energy experienced several mishaps. The company acknowledged spilling toxic drilling mud on three occasions, including a spill of some 600 barrels (25,000 gallons) in December 2009. Cephas Egbefome an environmental issues researcher for Ghana’s parliament, said the government fined Kosmos $35 million for negligence. But the fine, which Kosmos challenged as not following Ghanaian law and ultimately did not pay, raised a number of concerns, Egbefome said. The government probe was quick and opaque; the methodology for determining the fine was unclear. “Kosmos openly challenged the legal basis of the fine, describing it as totally unlawful,” he said. “What the law says is that in the event of a disaster, a spill, the polluter must pay. But the law doesn’t talk about a fine,” he said. “Kosmos spilled mud, a committee was set up to investigate Kosmos and the committee came out with a fine, contrary to our law. Kosmos declined to answer questions about the mud spills. Daniel Amlalo, Ghana’s acting Enviromental Protection Agency director, said the mud spills were properly addressed. “Lessons have been learned from that and government has put measures in place to ensure that it does not happen again,” he said. Ghana’s troubled regulation of the offshore oil industry sits against a backdrop of other West African nations with dubious environmental records. The Nigerian oil industry, already infamous for its disastrous environmental record in the Niger Delta, also has problems offshore. In December, Shell said a spill occurred at its Bonga field, approximately 120 km. off Nigeria’s coast. This past December 20th and 21st, oil spewed from a ruptured fuel line connecting the Bonga platform to a waiting tanker. Before workers noticed the spill, Shell said that up to 40,000 barrels (1.68 million gallons) had leaked, reportedly making it the worst offshore accident in Nigeria since 1988. The Nigerian government takes a hands-off approach to clean-up operations, maintaining little in the way of vessels or equipment. Each company operating in the country is required to stockpile clean-up equipment and the industry leaders in Nigeria have also enlisted the U.K.’s Oil Spill Response Ltd.
After the December spills, Nigerian Senator Abubakar Kukola Saraki denounced the National Oil Spill Detection and Response Agency for having to “rely almost exclusively on the grace and benevolence of the oil companies” in a clean-up effort. After years of denial, Royal Dutch Shell recently acknowledged that “operational issues” were responsible for two other large spills in Nigeria’s Ogoniland in 2008 – pollution in the Niger Delta that the United Nations Environment Program said would cost $1 billion to clean up. Shell said sabotage is thwarting clean-up efforts and more than three years later, oil remains in the water and on land. A November 2011 report from Amnesty International says the spills destroyed the livelihoods of 69,000 people. Angola offers another bad example, said Kristin Reed, an environmental researcher at the Human Rights Center at the University of California, Berkeley. Reed described Angola’s oil industry as one without any state or independent monitoring or oversight. She said the situation is made worse by Angola’s press restrictions that limit public information about oil operations. Anecdotal news of spills and pollution sometimes spreads via blogs and the Internet but official details on incidents and who’s to blame are rarely available. And the tiny nation of Equatorial Guinea, an oil producer since the mid-1990s, also has no spill response plan, no clean-up equipment or vessels, no independent press and no agreements with neighboring countries to combat pollution. In Equatorial Guinea, oil companies monitor themselves and handle their own cleanups. The ICIJ asked ExxonMobil, how the oil companies conduct self-monitoring in the region and to whom they report. David Eglinton, a spokesman for ExxonMobil, promised a response. He has yet to give one. In Sekondi-Takoradi, Ghana’s “Oil City,” activists from Friends of the Nation work with the communities closest to offshore drilling operations. In two years of monitoring on behalf of local residents, the group’s Kyei Yamoah, has noted an increase in whale deaths. “A whale washed ashore in October, bringing the total number of dead whales on our beaches since late 2009 to eight,” Yamoah said. Christiane Badgley is a journalist and documentary film producer who follows oil development in Africa. This article was produced in cooperation with the Pulitzer Center on Crisis Reporting. Click here to see more of her Ghana oil reports. FACT CHECK: Did Gingrich ‘slash’ federal spending?